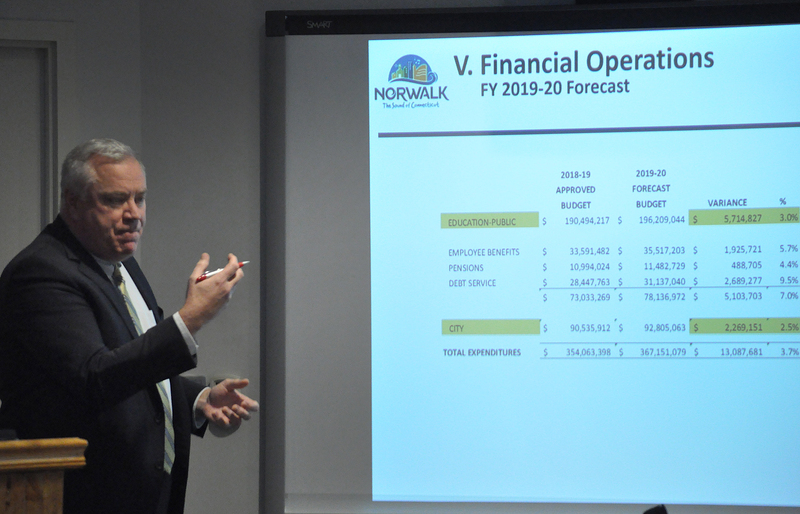 Norwalk Chief Financial Officer Bob Barron explains budgetary issues during a December meeting in City Hall. NORWALK, Conn. – Norwalk Chief Financial Officer Bob Barron has resigned, as the City works to establish budgets for 2019-20 and Norwalk property owners complain about the latest reval. Mayor Harry Rilling in a statement attributed Barron’s sudden departure to workplace issues and said Norwalk Public Schools Chief Financial Officer Thomas Hamilton, former Norwalk Finance Director, and NPS Budget Coordinator Kristen Karzcmit have stepped up to help the City. Barron could not be reached late Wednesday for a response to Rilling’s statements. The news of Barron’s departure came to NoN via former Common Council member David McCarthy, who at 9:27 p.m. Wednesday left a comment on the story about Rilling running for reelection. “I hear Bob Barron quit in a huff. Without him, Rilling literally has nothing…not even the ability to run day to day operations,” McCarthy wrote. A City Hall source speaking not for attribution confirmed that Barron had left, and said that the “in a huff” description was accurate. “Chief Financial Officer Bob Barron submitted his resignation on January 17, effective immediately. In the interim Norwalk Public Schools Chief Financial Officer Thomas Hamilton and Budget Finance Director Kristin Karczmit, will be stepping in to assist. “Over the last year, we have been working closely with Mr. Barron regarding his leadership, management style, and treatment of city employees. This has been an ongoing and coordinated effort through the Mayor’s Office and Personnel Department to improve morale across the six departments that reported directly to Mr. Barron. While I cannot comment specifically on these matters, I can share that recent accounts provided to me by Mr. Barron’s staff raised significant red flags and caused alarm. When we attempted to discuss our concerns with Mr. Barron, he lashed out in anger and chose to resign rather than work through the issues he alone had caused. “Let me be clear: a hostile work environment has no place in the City of Norwalk. Asked if the concerns involved #metoo issues, King said they didn’t. Barron has been with the City for nine years: as Director of Management and Budgets until August 2015, when he became Norwalk’s Finance Director following Hamilton’s departure to the Board of Ed, which he currently serves as Chief Financial Officer. Under the recent City reorganization, Barron became Norwalk Chief Financial Officer, with a $9,389 boost in pay, according to the packet for the Sept. 11 Common Council meeting. Hamilton has guided the Board of Education in formulating a 2019-20 operating budget request that is $11.7 million more than last year’s approved budget. “We are pleased to work as a team with the City of Norwalk to ensure a successful 2019-20 budget process for Norwalk. Tom Hamilton, Chief Financial Officer for Norwalk Public Schools, as well as NPS Budget Director Kristin Karczmit, will both be available over the next few weeks to assist the City’s Finance Department in meeting deadlines for operating and capital budget submissions. The Board of Education and City of Norwalk have a mutually supportive relationship, and we’re happy to offer our support during this time of transition,” Superintendent of Schools Steven Adamowski said in a statement issued Thursday morning. Meek, at 11:41 p.m., indicated that he did not know Barron had left. “I did get an undeliverable email message from Mr. Barron earlier today, so it would seem so. If he is no longer in our employment, I wish him well on his future endeavors,” he wrote. Barron had been working to deliver a recommended 2019-20 operating budget to the Board of Estimate and Taxation on Feb. 11, a deadline set by the City Charter. A recommended capital budget is due Jan. 31. The Finance Department has a new Director of Management and Budgets; Angela Foley started about three months ago, King said. Foley replaced Lunda Asmani, who held the job for less than a year before leaving to become New Canaan Budget Director in June. Chitsamay Lam was hired to be the City’s new comptroller in August, replacing longtime comptroller Fred Gilden, who has retired. Barron on Jan. 10 told the Council Finance Committee that City department heads submit their budget requests in December. In an odd coincidence, Bob was the former Finance Director for the City of West Haven. Last week, their Finance Director surprised them with an unexpected resignation letter and walked off the job. If he went to West Haven, good for him. It seems to me they are smearing him in the media to spin this. He is and was always a gentleman, so I find their version hard to believe. Even if it’s 100% true, discussing personnel issues like that in the media…wow. I would expect a lawsuit. How many staff have been chased out of city hall by this administration? Mr. Barron arguably held the most important job in city hall. He quits on Friday, at a critical time in the budget and revaluation process, and Norwalk taxpayers, as well as our BoE Finance Committee Chairman, aren’t notified until someone comments 5 days later and forces a statement from the mayor’s office at 11:25PM. How long was Mayor Rilling going to wait to make this announcement? I continue to be concerned at the lack of transparency and respect for residents displayed by Mayor Rilling’s administration. I would like to know why Mayor Rilling and Ms. King did not see it fit to communicate such an important development to stakeholders, the press and the public at large in a timely manner. The public should not have to rely on former council members who have moved to Florida for information about critical developments at city hall. A second point, only in government does a manager who is under HR review for “workplace issues”, receive additional responsibilities and a raise. I always found Bob Barron a consummate professional and refuse to believe any innuendo against him. He was exactly what the city needed to hold spending in check against deteriorating city department cost escalations. The loss here is Norwalk’s. Further, given the school budgets are the largest consumer of city finances I am opposed to the NPS finance chairman having fulfill this role, even partially, due to the obvious conflict of interest. This should not be allowed! I didn’t know Mr. Barron well, but wish him well. He was always polite and cordial during our exchanges. One can only imagine the degree of stress that he and other municipal finance managers are under when Connecticut politicians push the boundaries of creative accounting in our financially strapped state. Good luck Tom Hamilton and Kristin Karczmit, you have a lot on your plates. Mr. Barron checking over and over again 3,000 account numbers with every department head? Can you imagine? Sounds like s nightmare scenario. Doesn’t this seem like excessive numbers? Stressful. How did Mr. Barron ever leave the building? That house is too darn bloated to even manage effectively. And who is managing it anyway? Is Mayor King managing it, or is Mayor Rilling managing it? Why has Mayor #1 not released a statement about Mr. Barron? Confusing… No wonder Mr. Barron has had enough. God love anyone who attempts to take on this self serving, “Fat” City Hall. The excess of departments is staggering (would love to see a list itemizing and tracking the bloat), and the departments are obviously inefficiently run and have run amuck. Departments aren’t even situated together in the same spaces we have learned, which is comical and troubling all at once. Flat out bad management. Best of luck to Mr. Barron in his future endeavors. Thank you for serving Norwalk. Norwalk needs new leadership. City Hall can no longer afford to be managed this way. Lisa for Mayor! Rilling admits that Barron quit last Thursday, the 17th — “effective immediately”. Today is the 24th. So that’s six or seven days (depending on how you count) that Rilling had knowledge of an event of significant importance to the City and yet said nothing. How long was he planning to keep it secret, and why? Norwalk’s Mayors have never used Prof. Search to secure an Outstanding Finance Chief. Or any other senior City Administrator. As long as Norwalk citizens vote for Mayors and Council members lacking business experience or solid knowledge of basic economics/finance we’ll remain a failing City with a poor reputation for governance. That’s why we have a stagnant Grand List for an entire decade. Business avoids Norwalk. Just ask the major firms in Fairfield County. Cities with good records for attracting Top Talent like Stamford have no problems attracting new business. When a City lets go its Financial Head Administrator the word really gets around in the largest business community. But it doesn’t surprise any who questioned how a former Police Chief could effectively manage a City of almost 90,000 with a $350 million budget. If Nowalk citizens want their City run professionally they have no alternative other than to elect City officials with the appropriate business and management skills. Your remarks are always so negative. Surely, there is something positive you can say about the city you call home. Bloat, bureaucracy, higher taxes, stagnating property values and a school system busting at the seams due to the proliferation/non-enforcement of illegal apartments is hardly anything anyone can be positive about. The latest, shafting homeowners with fictitious inflated revals with higher property tax bills to ensue. Norwalk’s fate is all but sealed as a Bridgeport “mini me” . . . but rest assured it will be business as usual as city hall inflicts more pain to the taxpayer. . . unfortunately, Norwalk may have lost its’ last grownup in the room with Mr. Barron’s resignation. You guys need to relax on questioning the delay in announcing this. I’m sure that the reason that Josh Morgan didn’t have a chance to prepare a statement on this was because he was up to his neck in grant writing. Am I right? Can one department create the budget for another? Is there a conflict of interest? “Hostile” work environment. Nice. Perhaps Mr. Barron created that simply by asking – why? City Hall spends with impunity, without reason or accountability. I’m sure any questions about spending are considered “hostile”. What is amazing is – when will taxpayers respond to the secretive, hostile to residents – operating philosophy of this King-Mayor and his minions? November – make a change or try to move. Those are the options. Do you have any verifiable proof to back up your opinions. I will be waiting for the links. Not only is this temporary appointment of a BoE Chief Financial Officer a conflict of interest, but -perhaps- a dry run to combine the two positions to save money for the city. If so, BoE budgets, including this present budget, will be approved without question. Tax payers beware! Bob Barron resigned from his position. Why put out such a detailed, defensive statement with broad, unsubstantiated accusations of mismanagement and inappropriate behavior? It is incredibly hard to believe that there’s not one person in the Mayor’s office, Personnel, Communications or Legal with the intelligence and courage to step up and stop the City from releasing such a one-sided, potentially slanderous and totally unnecessary diatribe. Everyone who played a role in preparing or releasing that statement should be fired, and the press release following that event should simply state, “stupid is as stupid does”. Well I guess it all makes sense now. Teachers aren’t getting paid for their extra work because “there’s a problem downtown” … site based budgets don’t match that which was approved by BOE line for line, and accountability of funds/ how they are used are never audited… I guess that means the city is in good hands right?